Founded in 1963, Weight Watchers (WW) is a healthy lifestyle program that operates in approximately 30 countries. Since its inception over 40 years ago, Weight Watchers have helped millions of members achieve sustainable weight loss. Oprah Winfrey even took a 10% stake in the company in 2015. Weight Watcher’s mobile app is included with a customer’s Weight Watchers subscription. With competition from free food tracking apps, Weight Watcher’s must work to outshine it’s competition. I took on this app as a problem due to frustrations that family and friends were having with this app. I have been a Weight Watcher user in the past to curb my sugar, so I Signed Up again to explore the issues with WW’s current app. In it’s first round of revisions, my hypothesis was that user complaints stemmed from issues in it’s Minimum Viable Product — diffculty in tracking food. Weight Watcher’s customers include both male and female, 18 years or older. If you are under 18, you need written medical permission to join meetings. 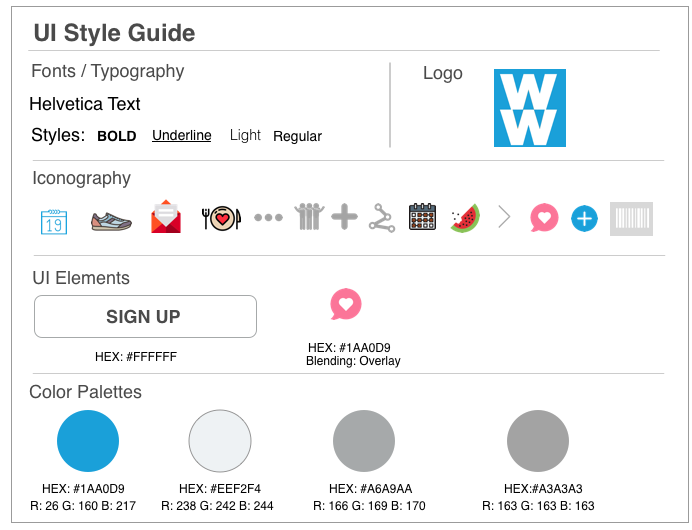 Users show a wide range of data literacy, from advanced long time users to total beginners. For the purpose of redesign, I have resolved to orient WW app toward new users. During the process to better under WW’s mobile app problems, I began with research. 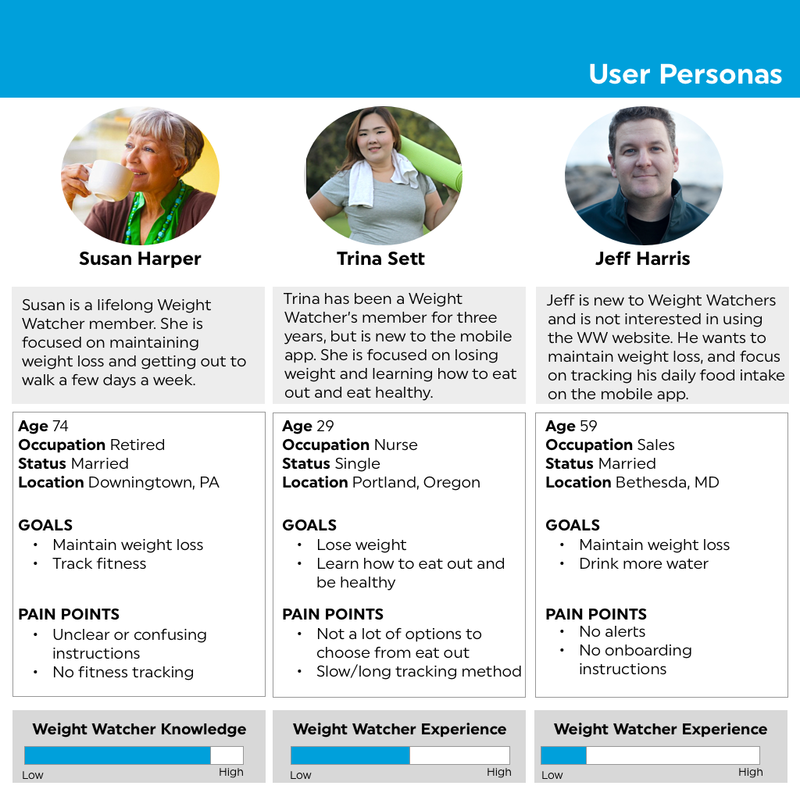 I interviewed five current users of Weight Watcher’s mobile app to discuss how users were using the app and to see which features were most used and which features were unused. Based on user interviews and user surveys, I developed a user story that was used to determine design decisions throughout the process of the project. 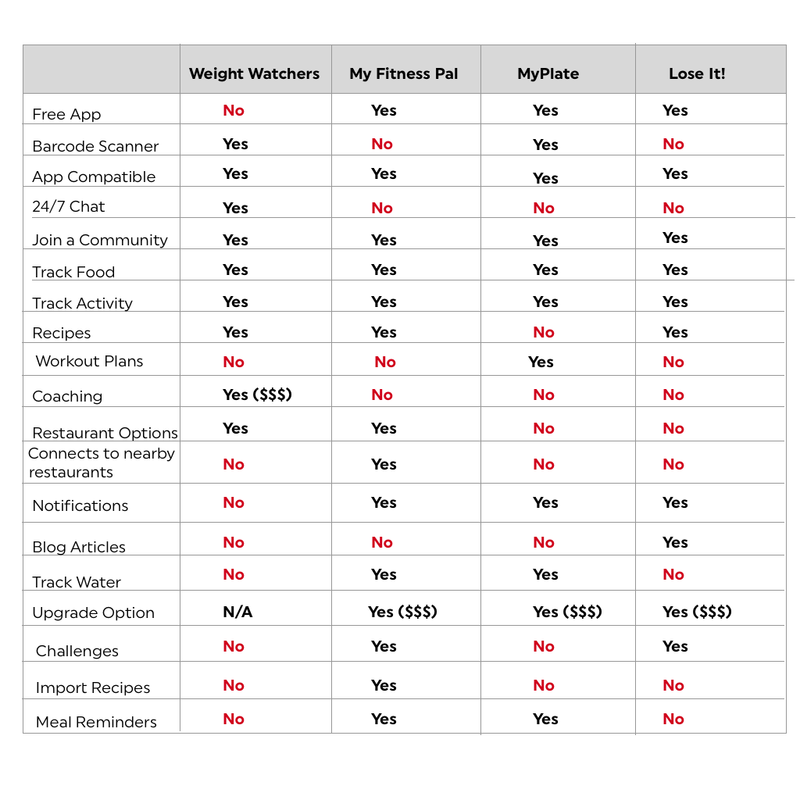 I also conducted a Feature Analysis, to compare functions of Weight Watcher’s verses it’s competitors — which included My Fitness Pal, MyPlate and Lose it! This identified features that I may want to integrate into Weight Watcher’s App. 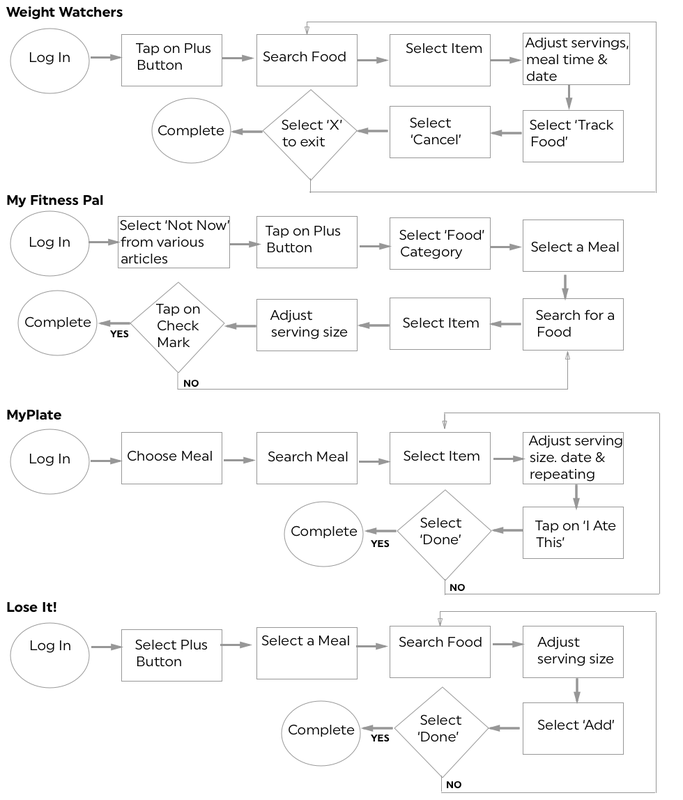 Lastly, I conducted Competitor User Flows for the task to track food, to compare Weight Watcher’s user flow. The task for all four user flows is for a user to add two cups of soup to their lunch. After conducting Competitive User Flows, I discovered that tracking food in the WW app was very similar to it’s competitors, and although it could benefit was some changes (ex: not having to cancel out of tracking to get back to home page) it’s overall UX worked. Instead, I discovered a major flaw in WW’s mobile app. Unlike other food tracking mobile apps, Weight Watchers does not add up caloric intake. Instead, it adheres to a points plan that gives you daily and weekly points. In November 2010, Weight Watchers announced that its points system was being replaced by a new PointsPlus system. At the end of 2012, the PointsPlus and Pro Points systems were adjusted slightly. 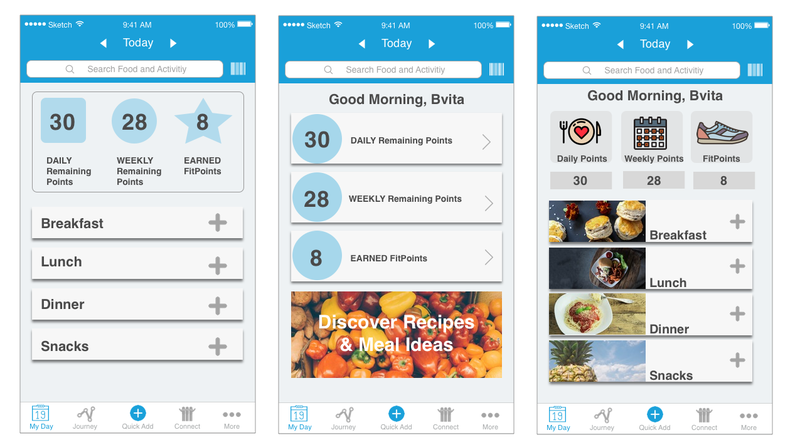 In December, 2015, Weight Watchers announced another sweeping change to SmartPoints. The new SmartPoints system is based on the calories, sugar, saturated fat, and protein contained in the food. As someone who has used Weight Watchers, this points plan is confusing to me especially since it is constantly evolving. For an individual who is a new member of Weight Watcher’s, the point system is alien. The Problem: Based on my research, new Weight Watcher members are extremely confused with the point system, and that confusion translates to the use of the mobile app. Integrate an onboarding experience for new Weight Watcher members to understand how the points system work and how to use the mobile app easily and effectively. Although I was eager to get to sketching, I knew I had to get back to research. UX is never a linear process. I needed to understand how Weight Watcher’s onboards users on it’s website, and apply that method to its mobile app. In addition, I wanted to get direction on how mobile apps onboard without it being a laborious process. Out of the three competitive apps that I reviewed, only Lose It! had indicators to show users how it’s content worked. I found some great articles on mobile onboarding (see bottom of page for links) and began some comparative mobile onboarding researching, downloading apps including Zendesk, Yo, WhatsApp, Waze, Vimeo, Twitter, Trello and many more. 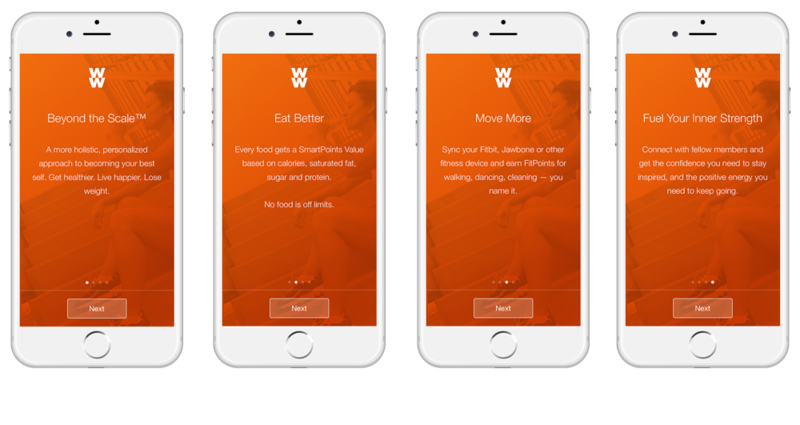 Since these screens would be the first impression of Weight Watcher’s app, it was important that the mobile onboarding was done right. I wanted a hybrid of function-oriented onboarding, that focused on key functionality, benefits-oriented onboarding, that focused on presenting the benefits of the app and progressive onboarding, that relies on the fact that users learn more by doing. Whew. Based on user interviews, competitive analysis and user research, I categorized my data based on pain points, pleasures context and behavior. I began sketching out features that users want and need. I decided I wanted a hybrid onboarding that consisted of benefits onboarding (explains What does the app do? How can the user integrate it into their life? What value will this integration provide?) and progressive onboarding. Users understand the benefits of Weight Watchers (lose weight, track food, become healthier) but what they don’t understand is what the App can do for them. So out of the two onboarding techniques the progressive onboarding was the most important. This is a true walkthrough of the app that presents information to the user (the learn by doing method). I had several options for Weight Watcher’s new home screens — ultimately choosing the far right screen after user testing with 5 current users of WW’s app. Click here to see my redesigned app in action!